The memorial garden began in 1994 when a committee was formed and it was decided that 'All Saints' (the original name given our parish by the Bishop) would become the name of the garden. All Saints Memorial Garden was consecrated to the 'Glory of Almighty God' on Palm Sunday 1995. With much hard work, the committee began to create a beautiful enclave from an open field, a handful of palms, and a dozen pine trees. A stone altar was constructed and water flows from within to a pool below reminding us of the water of baptism. Benches are provided to sit, relax and reflect; a Gazebo is there to protect us from the rain; and statues remind us of those who loved God's creations. This is truly a wonderful preserve providing solace and serenity to all who enter therein. The guiding concept behind All Saints Memorial Garden is to provide a simple, dignified memorial for the cremated remains of loved ones. The refined ashes of each individual are placed directly into the ground to preserve the natural living state of the garden. A memorial plaque containing information of each interred individual is kept in the church. 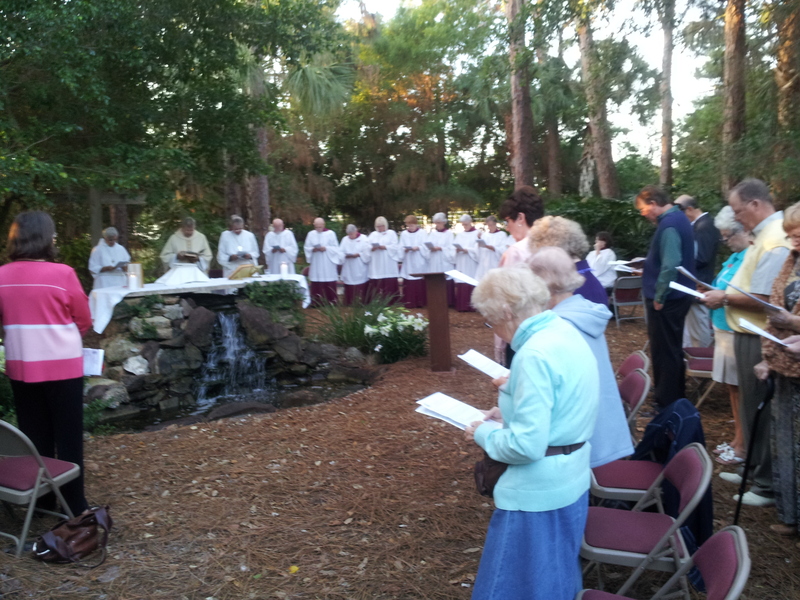 The garden is also used for special services such as at Easter Sunrise. Arrangements for celebrating the burial liturgy or interment are made through the church office. For a list of members buried in our gardens, click below. A diligent group of parishioners and garden committee members plant, prune, water and tend to the needs of the garden through each season of the year. Gifts to All Saints Memorial Garden are welcome at any time.